Following the panel on Islam and Christianity organized on 15 of March by the Geneva Centre for Human Rights Advancement and Global Dialogue («Geneva Centre») at the Palais des Nations in Geneva, the Secretary General of the AIDLR, Dr. Liviu Olteanu, had an exchange with H.E. Former Minister of Foreign Affairs of Algeria. They spoke together regarding international challenges on religion, peace and security, and also regarding a future collaboration on the next global summit planned by the AIDLR on Religion, Peace and Security and also on fostering religious liberty, interreligious dialogue and positive tolerance between people belonging to different religions. Dr. Liviu Olteanu offered Minister Brahimi a copy of the AIDLR's journal «Ambassadors for Liberty, Hope and Peace» and Mr Brahimi thanked him for what Mr Brahimi termed an important diplomatic tool of dialogue. 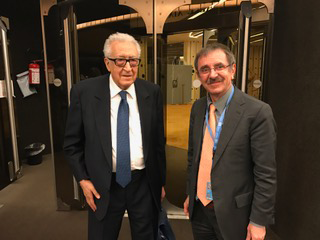 Photo: Minister Lakhdar Brahimi from Algeria and Dr. Liviu Olteanu, Secretary General of the AIDLR.